1 store, 1 outfit: Save huge until 11:59PM Tuesday November 29th. There’s an additional 20% off for purchases above 100$ with the ode WHOAGIFTS! Nice stuff, as always, Andrew! I wanted to point out that the sale doesn’t end at 12 noon, it ends at 12 midnight (11:59) Eastern Time, or 9pm (8:59) Pacific. 1. 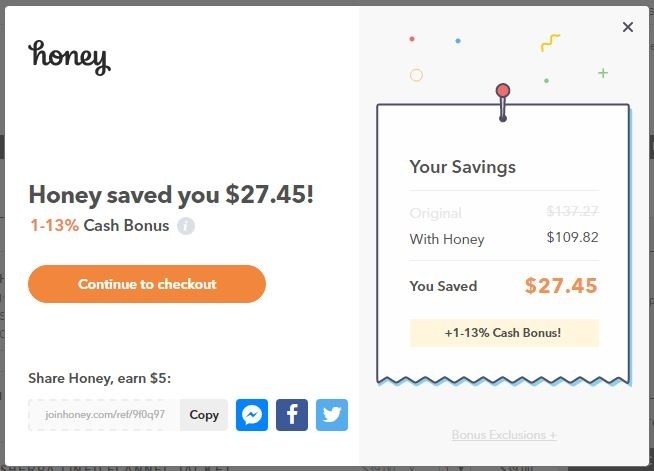 Honey FINDS AND APPLIES EVERY AVAILABLE CODE for you at checkout, so you don’t have to search for a coupon ever again. 2. Honey DETECTS SAVINGS OPPORTUNITIES ON AMAZON and shows you the lowest price of all the sellers. So without even having to spend time searching for extra savings, I will be saving, and potentially making, money on my purchases. As BL stated, “WHOAGIFTS” will save you an extra 20% at checkout. Honey found that and applied it for me automagically. With the gift giving season right around the corner, you really can’t save enough time or money. Have a great day, all!